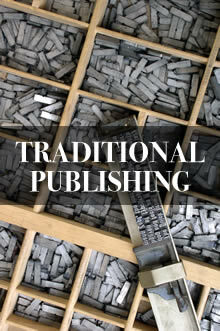 This article discusses the pros and cons of traditional publishing. Abandon your biases, study the business of publishing, and choose the publishing method that best suits you and your book. Perhaps the biggest myth in publishing is that as a writer, you simply choose a path: self-publish or find an agent. You can certainly choose to self-publish, but traditional publishing is a bit more like running for public office—you have to get yourself elected. Don’t plan on writing a manuscript, sending it off to a few publishing agents, and finding yourself comparing offers a few weeks later—even if your book is fantastic. Identify emerging and fading target markets and reader trends on an ongoing basis. Expertly choose 90–120 promising books every quarter from a nearly infinite supply of submissions (this number will vary widely from publisher to publisher). Keep experts on payroll who know how to design, display, and promote books to appeal to identified reader communities. Pay non-refundable advances against (hoped for) future royalties to authors. Produce books, print them, and ship them to downstream retailers at a rate that allows profit to be made while offering wholesale prices of 50% off cover price to booksellers and 62.5% off cover price to distributors. That means after the publisher assumes all that up-front risk, the bookseller gets half the pie (or more). The publisher must sell thousands of books before breaking even. Arrange bookstore tours, PR campaigns, and other promotions for books and authors (not all publishers offer these services, but some do). Have sufficient expertise and capital on-hand to compete for and negotiate license deals for books involving movie characters and celebrities. Cull out and backlist weak sellers on a quarterly basis to make room for new offerings. Warehouse and inventory backlisted titles for special and online order. Publishers have access to professional review sources. Many writers and professionals see a traditional publishing contract as a badge of prestige that can help you in your professional endeavors. Traditional publishers can assist with licensing deals, film rights, merchandising (toys and lunchboxes), foreign translations, large print versions, audio books, and more. Think of big publishers as mutual fund investors who own bundles of stocks. Many of those stocks will fail, but if some earn good returns and a few of them grow explosively, there’s a chance to make real profits. And they don’t make money buying a few shares. It’s not uncommon for a publisher to print thousands of copies of a new title. Even with efficient production and management, a new book release can require an investment of tens of thousands of dollars by the time it’s acquired, edited, designed, printed, and shipped. Big publishers are models of the notion that big returns come from big risk. Find an Agent – Most traditional publishers would rather deal with a community of trusted agents who know the publishing industry than wade through mountains of submissions, themselves. Sending query letters to Penguin or Simon and Schuster is not likely to produce gratifying results. Follow Directions—Publishing agents are not interested in sorting through stacks of unsolicited packages stuffed with manuscripts. Literary agents have submission requirements, and the number one requirement is that you demonstrate an ability to follow directions. Steve Hutson of Wordwise media offers the following instructions to writers on his submission page at http://www.wordwisemedia.com/submit . Let us explain a brutal reality of the publishing biz in the 21st century: Like almost every other agent or publisher out there, we don’t want to see your manuscript. So please don’t send it to us, because we won’t read it. We get hundreds of submissions from eager writers every month, and we just don’t have the time. There aren’t enough hours in a day. Surprised? Instead (again, like almost everyone else) we start the process with a query, a simple one-page summary with the pertinent information that helps us evaluate your project. EVERYONE: Download our query form, fill it out completely, and return as an email attachment. Keep it to one page, single-spaced, no matter what. Do not copy the text into the body of your email. Do not alter the form in any way. Specify the agent’s name in the subject line, if you have a preference. As simple as these directions are, Steven Hutson says at least half the submissions he receives fail the “can you follow directions?” test. Know Your Subject and Your Reader—Aside from contact information and the expected technical information (word count, title, genre, etc. ), the query form offers some simple but important blanks to fill in. The descriptions and explanations provided below by me are not included in the form. Agents want to see if you already understand this stuff. Synopsis (2 paragraphs max): This is your “elevator pitch.” If your book is fiction, explain the characters and the arc of the story. If your book is non-fiction, explain the arc of your reader’s Quickly make the agent interested in receiving a book proposal. If your book offers a new approach or fills an information void that hasn’t been written about yet, mention that, too. Summarize your story and make it interesting. Fiction Synopsis Example: In a country where civics education has been absent from schools for decades, two wildly unpopular candidates battle each other and the skeletons in their closets to assume the highest office in the land. The contest will be decided largely by voters who understand no more about democratic politics than the candidates do. In this twisted parable, the machinations of two flawed politicians distract the populace from the larger problems of a democracy engaged in a desperate struggle to rediscover its founding principles. Non-fiction Synopsis Example: The World’s Greatest Book offers a guide for authors who wish to produce quality books through traditional or independent channels. Rather than advocating for a particular type of publishing, the author explains the pros and cons of various approaches. Readers are empowered to make intelligent publishing decisions and form realistic expectations about costs, expected returns, and what they’ll be required to do to support their publishing endeavors. Target Audience: Imagine that a publisher will print and distribute 30,000 copies of your book if you can convince them that at least that many people will surely buy it. Readers won’t buy your book “because it’s good.” It’s called the “best seller list,” not the “best writer list.” Why will they buy your book? Who is “they?” If you can’t identify and substantiate the existence of a community of readers who will definitely buy it, why would you expect a publisher to invest in it? Like all savvy businesses, publishers take calculated If you have a million Twitter followers or a column in the New York Times or a record deal with Sony, it should be easier to convince a publisher that a large audience is interested in your material. If your audience is “general readers” or “Herman Melville fans,” you’re probably going to have a difficult time getting your book represented. Take-away (if any): This applies mostly to non-fiction books, but think of your book as a problem offered to a community of readers who need a solution. If someone needs to learn to write code in the C programming language, that skill carries a market value far in excess of the book’s price. If someone values their attachment to a particular ethnicity or geographic location, your book might offer them new and deeper perspectives on their own history. A book on real estate might offer information that helps readers attain the appropriate certifications and then open and operate a successful realty. How will your reader benefit?Somewhere down the road, your book will have to convince readers that what they’ll get in exchange for their $20 and 8 hours of reading time is worth that investment. Agents and publishers want to know that you understand your book’s value proposition. If you’re unable to declare that clearly and succinctly, they’re not going to wade through your manuscript hoping to discover it. About the Author: Publishing agents don’t care what hospital you were born in. They want to know you’ll be a suitable business partner. Are you a thought leader in your field? Do you have life or professional experience that will make your book a compelling read? Maybe you’ve produced excellent results for others as a coach or consultant and you want to package your wisdom as a book. Is your book based on a personal or professional transformation? Is this your first book or the most recent of many?A publisher won’t be signing a contract with your book; they’ll be signing a contract with “About the Author” means “About the person who is asking for financial support for a risky venture.” What can you share about yourself that makes you worthy of that vote of confidence? Can you follow directions? Have you thought past the art of writing to create a product that’s positioned to sell in a competitive marketplace? Do you know who your readers are, what they like, what they need, and how to reach them? Are you able to explain why someone should read your book without finding a place for the two of you to sit down? Can you convince a financier that you and your intellectual property are worth investing in? Major houses do publish fiction—even first novels by unknown writers—but consider the risk involved and the competition for those contracts. Fiction is fundamentally an art product, and as such, its value or degree of public acceptance is difficult to predict. Endorsements, writing awards, academic, and other qualifications can help your case, but a true literary craftsperson might get rejected for being too esoteric as quickly as an amateur will get rejected for being a self-edited hack. Great books are not necessarily great products, and great products are not necessarily great books. If you’re a fiction writer, you’ll be even more challenged to provide compelling business evidence in your query letter. Think like a publisher and you’ll understand why. Indie writers rail against big publishers all the time, but publishers are in business to make money. Allegations that big publishers hate self-publishers are nonsense. Ask anyone in their employ why they’re there. You’ll find they all love books and writers, but their jobs require them to make tough decisions that look good on a spreadsheet. Sometimes that means not investing in your excellent book. Writing is an art; publishing is a business. As soon as you start down the path to selling your writing, you have entered into a new business—a publishing business you can fail at if you don’t understand it or the role of the partners you choose. As you consider the traditional publishing route, understand that publishers exist to make money by selling books in volume. Compared to the major record labels (who are analogous to big publishers) who push junk to top 40 radio stations (analogous to bookstores), big publishers do a remarkable job at introducing high quality products to the market. However, books by celebrities, licensed movie character stories, perennial favorites, reissues of old classics, and books about the latest fad fashions and diets will always be the natural bread and butter of the industry. Your novel may be high art, but if you had money to invest in a book, would you choose your own book or a new, “unauthorized” celebrity biography as the best way to turn a profit? Publishers ask that question every day. Their survival depends on it. What are the downsides of traditional publishing? A publishing contract may offer you some prestige, but it’s no guarantee that your book will survive past its 90-day tenure in bookstores (if it makes it to stores at all)—and that’s after the typical 18–24 month delay between the day your contract is signed and the time your book is released. After the long wait and a season in the limelight, you may be one of the lucky successes, but prepare to be backlisted. Your book will remain available to order, but sales will eventually fall off and bookstore table space will be allocated to a new rising star. You can continue to promote your book, but unless your royalties from sales have already exceeded the amount paid to you as an advance, your work will mostly help the publisher recover their investment. In fact, some authors negotiate buy-out terms so that once book sales drop below a certain level, they can recover ownership of their work. Publishers employ editors and artists who have particular notions (based on professional experience with what sells and what doesn’t) about how your book should sound and look to appeal to specific reader tastes. The cover design, for example, is not created to please the author; it’s created to appeal to the reader. You may not like it. Too bad. If your submission is rejected, don’t think of yourself or your book as a failure. Your book’s suitability as a retail product is not necessarily a reflection on its artistic merit or practical value. Your work may appeal to a niche that’s too small for big publishers to profit from. A self-publisher who can sell 5,000 books to a community of 100,000 readers can earn a nice profit. A big publishing house would starve at that scale. Some writers sell virtually nothing through standard retail channels, but they bundle thousands of books with training programs or sell them in the back of the room after speeches (One of my clients sold 1000 books after a single keynote address. He sold only 12 books on Amazon that same year.). If you have direct access to audiences, you may not need a publisher to help you sell books, especially if book revenues are auxiliary to speaking fees. Some authors prefer creative autonomy that supports their artistic directions over having a publisher design a cover or edit the prose to appeal to a particular reader demographic. Self-publishing, when done right by informed authors can produce excellent results and lucrative opportunities—and if you’re not a traditional publisher, success can arguably be defined in terms of artistic satisfaction. Print on Demand (POD) bypasses a number of design compromises that big publishers make to save ink, paper, and shipping costs on huge press runs. Though (sadly) few authors make the investment, self-publishing offers opportunities to produce books that are designed to higher standards than those produced by the trade. Some authors write books to establish professional credibility. They may sell very few books or even give books away, but if having “written the book on the subject” wins them contract work, they may see their publishing venture as a winning strategy. If you do seek a publishing agent, you are seeking a partner who will help you introduce a retail product into a marketplace. Go to a bookstore and you’ll see thousands of titles by authors who followed directions, defined their audiences, understood the value proposition of their books, and found a way to convince a traditi9onal publisher that their work was worthy of investment. You can be one of them, but adjust your expectations and business directions accordingly. If you’re ready to take the risk that your book won’t be a big performer in the publisher’s catalog, you won’t find a more interesting or exciting business. Become a publishing-savvy author and keep sending in query letters until you get a positive response. Some author will be next to make it to the top of the bestseller list. Why not you? Whatever path you choose, abandon your prejudices and do your homework. Base your decision to publish traditionally (or not) on smart business strategy. Understand the risks and the odds of success. Form realistic expectations about what you’ll put in and get out of the publishing business. Decide whether your objectives are primarily artistic or commercial. Determine whether a traditional publishing house will be better equipped to reach your readers than you are. Assess your audience and your access to them. Be able to state the value proposition of your book. Know how to assert yourself as a subject matter expert or literary force to be reckoned with. And if you’re first prompted to make those judgments by an agent’s query form template, let that serve as an important reminder of the risk you take by publishing through any means without having answered them ahead of time for yourself. What does it take to publish my literary works in your publishing house? I don’t run a publishing house other than for my own books, but I do help many authors establish their own. Reach out if I can advise or assist.